Big Data is everywhere around us and we constantly hear about it promising to disrupt multiple industries. These 8 companies already have their Big Data success stories. Would you like to hear them? As we wrote several times already, various types of Big Data analytics can help deliver meaningful insights, helping your business succeed. These insights are based on the wealth of data every company or organization operating in the cloud has at its fingertips. As AI becomes the synonym for cloud computing, not using this information to provide Big Answers is the least recommended course of actions. In all fairness, you MUST use your Big Data to the max, as your competitors are sure to use theirs. These companies, their industries, infrastructures and operational budgets are quite different, as you will see. Rolls Royce Holdings, the world’s second-largest manufacturer of aircraft and sea vessel propulsion systems, works towards building true Industry 4.0 environments at its factories. As it generates 3 petabytes of data while producing 6000 turbine fan blades annually, the company went for integrating Big Data technologies into their operations. The RR engines (ran by more than 500 civil and 150 military entities worldwide) are controlled by Engine Health System, using up to 100 parameters nowadays, with all this data stored in the flight recorders and analyzed after the flight. Quite contrary, the next generation of engines will monitor more than 5,000 parameters and will always be connected to the cloud monitoring solution, in order to prevent issues before they occur. Rolls Royce invests heavily into building the Internet of Things both on their ground facilities and all the fleet of their marine vessels and aircraft in order to provide top-notch services and be able to compete efficiently. As the company’s income and market worth grows annually, this is a wise decision indeed. Transport for London (TfL), is the company operating millions of buses, cabs, subway trains, ferries, Oyster London Transport cards, roads and traffic lights systems that provide commuting to nearly 10 millions of Londoners and collect a goldmine of data daily. In-depth analysis of this data allows the company to understand what passengers commute locally and who has long routes, what roads and bridges are more loaded and what public transport routes face heavier traffic. Daily application of such data allows allocating more buses to more loaded routes to minimise the time spent commuting and improve the traffic flow; adjusting the traffic lights on the more loaded roads to allow them to increase throughput capacity and avoid traffic jams, and many more activities. More specific usages, however, include dealing with force majeure situations. For example, when the local council had to close the Putney Bridge for emergency repairs, commute routes for almost 900,000 passengers were put at risk. TfL was able to rapidly inform these commuters of the situation and offer them workaround routes, adjusting the traffic lights schedule accordingly, thus averting a major emergency situation. Efficient use of Big Data helps TfL successfully operate transport in one of the world’s most important megapolises. A network of 514 restaurants across the US has developed a proprietary Big Data solution with the help of an independent contractor. The solution, titled Smoke Stack aggregates data from point-of-sale systems, inventory management systems, customer surveys, loyalty program data and marketing campaign results to visualize the business’s daily operations flow. For example, if some restaurant does not meet the margin threshold, the training or operations division can respond within 20 minutes, not after analyzing a brick-sized monthly report. To say even more, if the inventory management system notifies the HQ there is a stock of ribs left unused at some restaurant, the limited-time marketing offer for fried ribs can be developed within minutes and sent to the loyalty program members. If the demand still does not meet the offer, some ads can be sent into circulation to the neighboring area within minutes, so by the end of the day, the restaurant meets the expected margins. Such approach to utilizing aggregated Big Data for providing efficient Business Analytics helps Dickey’s provide excellent service and ensure stable growth of income. Carnival Cruises, one of the leaders of the cruise business, operating more than 100 ships under 9 brands is in the process of integrating all of its data-collecting systems into a whole. The point is that if the operator is able to dynamically adjust the pricing on items across their inventory, they can better tailor their offerings to the needs of their passengers. If every passenger sailing with Carnival Cruises would spend just one more dollar daily, that would mean $80,000,000 increase in the corporation’s bottom line annually. Such a prize is well worth the investment into Big Data, and the company hopes leveraging the Big Data tools against vast amounts of structured and unstructured data from disparate sources will help them reach their objectives. how the world’s leading car sharing network has succeeded in evaluating their customers real lifetime value, so some are given discounts for renting a limo, while the others are sent to try their luck at used cars rentals around the corner. Stay tuned for the updates! 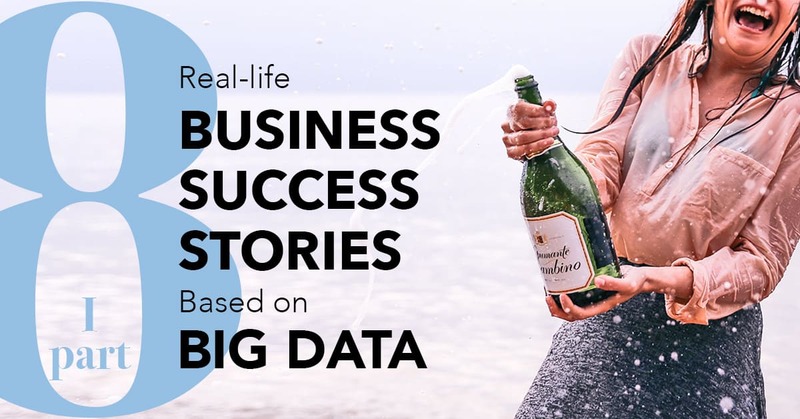 Meanwhile, if you can also share a business success story based on Big Data — we are more than happy to hear it!